The continuing global cooling and the start of the grand minimum require new targets in climate policy and a complete withdrawal from the previous warming madness. Neither did the sea ice in the Arctic disappear in the summer of 2016 as it was often predicted by nutty scientists (even by NASA, who wrote that Arctic summers would be ice-free by 2013), nor have global temperatures risen by an significance over the past 20 years, thus contradicting the projections of IPCC models. The chart above depicts in orange the range of the IPCC projections for the deviation of global mean temperature since 1990. The mean IPCC projection was +0.75°C of warming. Satellite measurements by UAH and RSS (blue line) show only an increase of 0.34°C. The models have been completely wrong. Source: When will “The Pause” in global temperature return? Moreover, the ice mass at both poles and Greenland have grown over the past years. Also the facts surrounding the increasingly cooler Antarctic are presented by a recent study. An extreme record value of almost -100°C was measured in 2004, but kept quiet in order not to dísturb the quasi religious fairy tale of manmade “global warming”. This is also one reason why sea level rise has increased less than originally projected and why the 1988 prophesy that all 1196 Maldives islands would sink underwater within 30 years have turned out to be preposterous. Not a single island has gone under! In fact, one recent paper found, for example, that the South Sea Tuvalu islands have grown, the shaming climate scientists! The time has arrived where government offices, authorities, weather services, media headquarters and educational institutes become staffed by educated and independent persons who are able to see the reality in the interrelationships of weather and climate and report them in an unfalsified manner. It’s the sun, water, clouds, vapor, ice, snow that determined the weather of our planet, and not life-sustaining trace gas CO2, which makes up only 0.04%of our atmosphere. Anyone who vilifies trace gas CO2 as a pollutant conducts him/herself in a manner that is hostile to life and is thus not suited to be a scientist, teacher, professor, journalist or politician! I don’t agree that the vilification of CO2 as a pollutant is unsuitable for journalists or politicians. Interestingly my comment got deleted or went to some undefined place (same place the CO2 forcing is vanishing to according to skeptics). How is this ok or even considered non-crazy? So this blogger is basically saying that anyone who says CO2 causes warming is anti-life. Great! Will this get deleted a second time? Tried to behave myself even though this blogger doesn’t and Pierre found it necessary to translate this for his blog. So for Seb, “pollutant” is equivalent to “causes warming”, or did I miss something? Reading comprehension problems, Seb? Difficulties with basic logic? And you wonder why you get no respect. The original sentence the author wrote is: “Wer das Spurengas Kohlendioxid (CO2) als Schadgas verteufelt, verhält sich lebensfeindlich […]”. Considering context (him declaring that CO2 does nothing but causing plants to grow) this means what I said it means. Everyone opposing his weird view of the world is “hostile to life”. There is no other interpretation. Yep, it is the author who makes them equivalent. Not me. 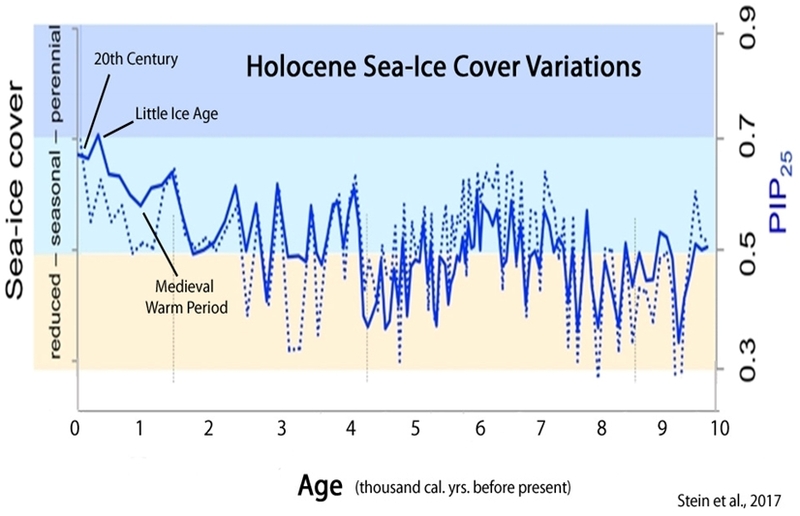 What were CO2 levels during the Roman and Medieval warming periods? ~275 ppm, which means it’s changed by 0.0135 of a percentage point (135 ppm) in the atmosphere. “Es sind Sonne und Wasser, Wolken und Wasserdampf, Eis und Schnee, die unser Wetter in den Klimazonen des Wasserplaneten Erde bestimmen, nicht das lebensnotwendige Spurengas CO2 mit 400 Teilchen in einer Million Luftanteilen oder 0,04 Prozent in unserer Stickstoff-/Sauerstoff-Atmosphäre. holds whether taken “in context” or “out of context”. You have just succeeded in once again making a complete fool of yourself. Bravo. Effing piece of work. The context is the author goes on and on that CO2 doesn’t cause the climate to change. Everything he says has to be viewed in this context. And it is also: “CO2 is a life-giving super gas (and only that) and everyone who says different should go away and is anti-life”. You are wearing filter bubble goggles. Take them off! The context is the author goes on and on that CO2 doesn’t cause the climate to change. Did the CO2 concentration change cause the climate to change here? 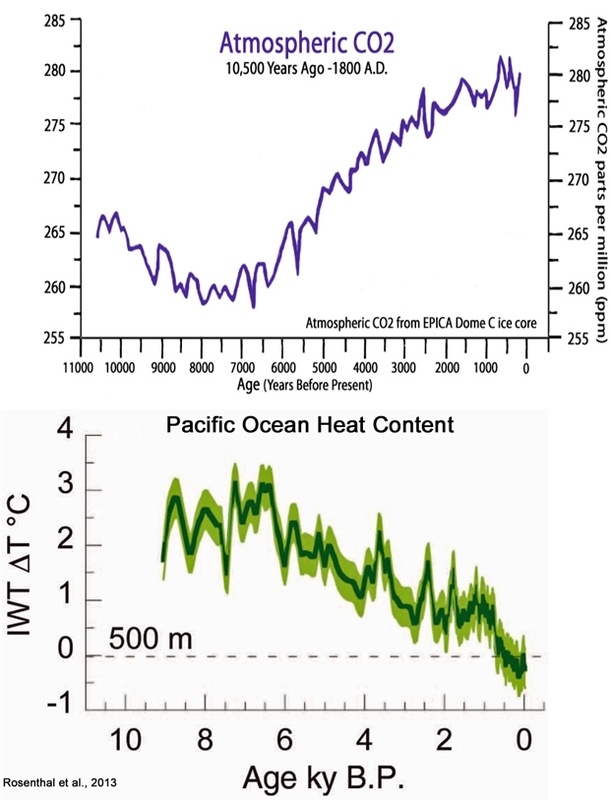 If so, it looks at though the correlation is opposite of what you believe: the ocean temperatures fall as the CO2 concentration rises. Same with long-term sea ice extent. As the CO2 rises, so does the sea ice concentration. But since you’ve written that you “don’t care” why that happens, I guess there is no point in discussing the mechanisms for these opposite-of-what-you-believe phenomena. But you go right on ahead and keep believin’. So you compare the temperature at one location in a certain depth with the reconstructed global CO2 concentration? Great! Even though, those two graphs are not incompatible. Warming by lets say 10 degrees will cause the CO2 concentration to further rise even though it continously cools afterwards down to lets say 5 degrees above previous temperatures (before the warming event). Should I prepare a spreadsheet for you to tinker with this mechanism? No, Kenneth! I wrote I don’t care to address your question. I guess there is no point in discussing the mechanisms for these opposite-of-what-you-believe phenomena. Only that is not the case. As I told you with acceleration vs. distance driven … the distance can still increase even though acceleration becomes negative. It’s not a linear 1 to 1 connection between CO2 and temperature, especially not in the case of temperature increase causing outgassing (see example with the 10 degree warming above). Keep believing … yeah right. You do that. Imagine up how the world works as you want. At the end it’s physical mechanisms everywhere. And they remain true/working whether you believe it or not. Warming by lets say 10 degrees will cause the CO2 concentration to further rise even though it continously cools afterwards down to lets say 5 degrees above previous temperatures (before the warming event). Should I prepare a spreadsheet for you to tinker with this mechanism? Oh yes, a spreadsheet will clear this up and help us all become believers! Perhaps another bank statement analogy will help us even further. Well, if you have no problem reading code we can do it with code too. I assumed it would be easier for you to read an Excel spreadsheet. If you prefer a bank account analogy in Excel, I can try and come up with one too. So the question remains … if someone would make an interactive visualization (or and Excel spreadsheet) of how climate science says stuff works, would you at least take a look at it and try to understand it? Your hubris is unfathomable. You assume that a spreadsheet and a bank account analogy will convince me that humans exert fundamental control over the temperature of the oceans by using more wind and solar and less gasoline and coal. spike55 made this astute observation of how nonsensicle and irrelevant one of slippery evasive SebH’s accounting analogis was. If I have $100,000 in the bank, I wouldn’t be spending $1,000,000 to stop it going up and down by $10 a day. SebH ignores the fact that tiny temperature anomalies are just noise in the noise rather than a valid signal, and are nothing to be worried about. What spike55 does is to give an analogy of the folly of pretending they are anything important, or that we should squander vast sums on the pretext that we should try to control that noise, or that we can. We shouldn’t, and we can’t. It is mindboggling to me why you insist on not trying to learn how the things you are trying to argue against are supposed to work. Obviously you have problems understand what I and other write, so I think a visualization of what’s happening might have helped. It doens’t need to convince you, but it might be enlightening to you how science says stuff works. Maybe you can find better arguments against the mechnisms then and be a proper skeptic. SebH ignores the fact that tiny temperature anomalies are just noise in the noise rather than a valid signal, and are nothing to be worried about. This is how you tell yourself that all is good? Ignorance is bliss, I guess. What spike55 does is to give an analogy of the folly of pretending they are anything important, or that we should squander vast sums on the pretext that we should try to control that noise, or that we can. We shouldn’t, and we can’t. Nope, what he does is completely misunderstanding the analogy and making up one that doesn’t reflect reality. A more correct version would be: If I have $100000 in the bank, I would gladly spend $2000 to prevent it from dropping to $90000. The vast sums you are talking about pale compared to whatelse we spend money on and the potential damage/costs of a continued climate change. And yes, we control this to a large extend. And yes we can and we should. So it seems like you’re saying that the tens of trillions spent on reducing CO2 emissions will be of relatively minor cost (just single-digit percentages of our overall expenditures) that it will be far more worth it than to undergo the “damage/costs of a continued climate change”. And yet to date, with the 130 ppm increase in CO2 and the 1.0 degree C of (surface) warming and ~0.1 C of ocean warming we’ve experienced since ~1900, the “costs” of warming and elevated CO2 have been effectively non-existent relative to the great benefits. The Earth has been greening (less desertification today than in the 1980s), crops yields have grown exponentially, growing seasons have been extended, polar bear and penguin populations have been increasing, fewer species have been documented to having gone extinct, fewer people die because of temperature extremes (humans are 20 times more likely to die from exposure to extreme cold than extreme heat), coastal land area and beaches are growing all over the world instead of declining due to sea level rise, hurricane frequencies and intensities have been declining for decades, drought and flood extremes are less common today than during the Little Ice Age, storminess and extreme weather are less common when it’s warmer than when it’s colder, Greenland and Antarctica have combined to contribute just 1.5 cm to global sea levels with their meltwater equivalents….and on and on and on. The catastrophic future climate scenarios that you think we need to spend tens of trillions on to avoid are found in modeled projections, not observations. Why would we want to spend so much money on something that (a) it is questionable that we could have more than a modest impact on relative to the natural factors that induce climate changes and (b) has not yet shown — in the last 150 years! — that there has demonstrably been any significant negative impact when weighed against the climate conditions associated with cooler periods (such as the Little Ice Age, with more droughts, crop failures, cold-related deaths and extinctions, etc.). Why are you so unskeptical about these modeled projections of climate doom associated with CO2 increases when it has not been shown that such increases have had a negative impact to date? Why not more skepticism? Yes, that is what I am saying. Also depends, of course, on how much you value a human life. Kenneth, it is about the future. The frog might be happy that the temperature is slightly warmer now in his kettle and tells itself that he doesn’t need to do anything yet. At what point should the frog begin to worry? When it is already too late? The catastrophic future climate scenarios that you think we need to spend tens of trillions on to avoid are found in modeled projections, not observations. Yes captain obvious, the future hasn’t been observed yet. See, you believe that it is questionable because all you know is the worldview from your skeptic’s bubble. I am certain some peace-loving folks also can’t imagine that people would want to engage in military conflicts. They’ll oppose the equally large global spending on defense, but I don’t think you would agree that we should defund the military worldwide, do you? (b) has not yet shown — in the last 150 years! — that there has demonstrably been any significant negative impact when weighed against the climate conditions associated with cooler periods (such as the Little Ice Age, with more droughts, crop failures, cold-related deaths and extinctions, etc.). “been”? It is about the future! If a life ending asteroid would be on a collision course with Earth, would you then argue as well that all the past asteroids weren’t much of a thing, so why should we prepare for the big one now? It’s also not about getting us back to cooler conditions. Why does something need to already have happened (e.g. be observable) for you to accept it being real? And in case of climate change you tend to turn to “predictions” about the future that are based on the past (e.g. curve fitting) … a past that large hasn’t experienced much influence from human CO2 emissions yet. Why are those prediction models more real to you? Or why do you think they “cast doubt” on what climate scientist are largely saying will happen? I am skeptical about what you come up with to justify doing nothing. At what point will you agree that something has to be done? Let’s say we meat in 2050 and temperatures are another degree warmer than today. Everything that the models predicted has occured. Would that be enough observation for you to accept that something has to be done? I have the feeling you are asking for a ride in a time machine here. An even more impossible thing than showing what a 60 ppm CO2 concentration does to the oceans by experiment. Do you think this strategy is working? The frog might be happy that the temperature is slightly warmer now in his kettle and tells itself that he doesn’t need to do anything yet. Your frog analogies are irrelevant. Why do we need analogies when we have real-world evidence that the climate models so frequently get it wrong? We’re talking about the scientific merits of climate model forecasts and projections predicated on one single variable in the Earth’s climate system (CO2 emissions scenarios). This assumes that CO2 emissions not only influence what happens to climate, but they are what drive ocean and surface temperature, glacier melt, sea level rise, hurricane intensities, species extinctions, etc. And yet, once again, you’ve changed the subject to frogs in kettles of water. See, you believe that it is questionable because all you know is the worldview from your skeptic’s bubble. No, it’s questionable because the models have been so lousy, uncertainty ranges and error bars for the CO2 impact on ocean heat changes are an order of magnitude larger than the entire forcing value attributed to CO2 since 1750, the natural variability is so large that detecting an anthropogenic signal in glacier melt, sea level rise, surface temperature changes…is so uncertain that it’s akin to guesswork…. Hmmm. Why do I (or scientists for that matter) need observational evidence? Why don’t I just accept that the predictions of climate change disaster are real and will happen? Well, because the climate models are only as good as the data fed into them. And they’re usually wrong. According to climate modeling and “science” published in the journal Nature, we’ll have over 1 million species extinctions by 2050 due to global warming. This means we should average about 30,000 species extinctions per year between now and then. And yet observations in the real world indicate that we’ve only had one single species extinction since 2000. So you want me to just believe that 30,000 species extinctions per year (starting in “the future”, apparently) is “reality” because that’s what the models say. And because that’s what the models say is going to happen someday, we must act. Do something to stop it. Do you have any level of skepticism that we’ll have 30,000 species per year go extinct due to global warming starting at some point “in the future”? Do you question it at all? At what point will you agree that something has to be done? This assumes that something we can do is going to determine what happens to the climate. Considering all the uncertainty and the failure of climate modeling, I’d rather not sink trillions into “doing something” that may not have any impact. I don’t just blindly trust in climate models. I’ll leave that for you to do. Because you don’t get why an ever warming climate caused by more and more CO2 emissions has to be prevented. And it will be far easier and cheaper the sooner it gets done. You are listing everything good about the slight warming we already experienced, just like the frog is probably not unhappy to sit in slightly warmer water. And just like the frog, you keep ignoring the obvious predictions in favor of oscillations and cycles. You tell yourself that it won’t get to problematic temperatures. That’s why I find it a fitting analogy and not irrelevant at all. We’re talking about the scientific merits of climate model forecasts and projections predicated on one single variable in the Earth’s climate system (CO2 emissions scenarios). You believe that predictions are based on only one variable? You and I read very different model vs. observation articles then. And you don’t think your article reading is influenced by your skeptic’s bubble filter? Not really, haven’t we discussed this recently? the natural variability is so large that detecting an anthropogenic signal in glacier melt, sea level rise, surface temperature changes…is so uncertain that it’s akin to guesswork…. So, scientists should never send a rocket to a place where we haven’t been before, because we can’t predict what will happen to that rocket? Do you have any faith in the laws of physics and their ability to roughly predict the future? This means we should average about 30,000 species extinctions per year between now and then. And yet observations in the real world indicate that we’ve only had one single species extinction since 2000. Google “background extinction rate” and read some papers about it. And because that’s what the models say is going to happen someday, we must act. Do something to stop it. Let’s imagine it would be an asteroid heading for Earth. Don’t you think it would be easier to do something when years are left instead of days? You know, the difference between a small gravity tractor and Bruce Willis having to blow up the damn thing? Because you don’t get why an ever warming climate caused by more and more CO2 emissions has to be prevented. So I need to read about frog analogies because I don’t understand why we have to prevent the Earth’s climate from getting warmer? And it will be far easier and cheaper the sooner it gets done. What is “cheaper” about $38.4 trillion in 16 years? That’s more than half the $74 trillion global economy! And why must we spend that? To prevent Antarctica and Greenland from contributing another 1.5 cm to sea level rise (the horror!) over the next 56 years like they did during 1958-2014 with +85 ppm CO2? Or will the next 56 years lead to a doubling of that sea level rise contribution? Could we get – gasp – 3 cm of sea level rise due to Greenland/Antarctica ice melt?! just like the frog, you keep ignoring the obvious predictions in favor of oscillations and cycles. So the predictions of climate-induced catastrophe are now so right and so knowable that they’re obvious? Whatever happened to the days in which the IPCC said the long-term prediction of future climate states is not possible? At what point did they change their mind? They’re based on greenhouse gas emissions scenarios (RCP 8.5, etc.). What other variable is seriously and significantly considered for the predictions of glacier melt, temperature change, sea level rise, species extinctions…by 2050 or 2100? You and I read very different model vs. observation articles then. That’s what the IPCC says, SebastianH! Uh, you didn’t show me that it’s “nonsense” that scientists have yet to find a clearly discernible anthropogenic signal in sea level rise or glacier melt estimates. In fact, you linked me to a paper that said that the large natural variability conceals the anthropogenic signal. In other words, you supported what I had written! Why don’t I just accept that the predictions of climate change disaster are real and will happen? So, scientists should never send a rocket to a place where we haven’t been before, because we can’t predict what will happen to that rocket? Wow, so now we’re talking about rockets. Earlier it was frogs. Anything to distract, apparently. SebastianH, in the early 1970s scientists were saying that our aerosol emissions were cooling the Earth and could potentially lead to an ice age. Over 300 global cooling papers were published during that period. A tiny sampling is detailed here. Let’s imagine it would be an asteroid heading for Earth. Frogs. Rockets. And now asteroids. Why not just directly respond to the questions/comments about CO2-DRIVEN CLIMATE CATASTROPHE predictions? Why must you incessantly concoct these irrelevant analogies? We’re not talking about an asteroid hitting the Earth. We’re talking about the sensibleness of spending $38.4 trillion on a model-based “problem” that may be possible even though it hasn’t really been observed in the real world. In fact, in the real world, the climate changes in the last 150 years have been beneficial on net. I don’t just blindly trust in climate models. I’ll leave that for you to do. Frogs. Rockets. Asteroid collisions. And now…getting hit by a car as I cross the road. Are your analogies meant to be anything other than distractions, or means by which you can avoid answering direct questions about the efficacy of CO2-DRIVEN CLIMATE CATASTROPHE predictions? Grow some skepticism, SebastianH. Just because the models say that we’ll get 30,000 species extinctions per year doesn’t mean they’re right, or obvious. Question the models instead of just accepting them because they fit your humans-can-control-the-weather-with-their-emissions beliefs. What is “cheaper” about $38.4 trillion in 16 years? That’s more than half the $74 trillion global economy! It’s more than half of the economy the same way spending $500000 on a house is many times what you earn. Look up the global GDP and a forecast for the next years and count those $2.4 trillion per year against that increase. It’s a low single percentage of the economy. For comparison, if the US could somehow make their health care system as efficient as those of other industrialized nations, they could pay double or triple their share of this investment in the future. So the predictions of climate-induced catastrophe are now so right and so knowable that they’re obvious? Whatever happened to the days in which the IPCC said the long-term prediction of future climate states is not possible? Kenneth, we can not possible predict what will happen in the next hundred years that affects the climate. … we can only predict what happens if everything continues as it does now. Why must you incessantly concoct these irrelevant analogies? We’re not talking about an asteroid hitting the Earth. I was talking about doing something now vs. doing something when it is almost too late. We’re talking about the sensibleness of spending $38.4 trillion on a model-based “problem” that may be possible even though it hasn’t really been observed in the real world. In fact, in the real world, the climate changes in the last 150 years have been beneficial on net. Investing around 2% of the GDP into reaching a more sustainable economy is very sensible. Are your analogies meant to be anything other than distractions, or means by which you can avoid answering direct questions about the efficacy of CO2-DRIVEN CLIMATE CATASTROPHE predictions? Kenneth, since you obviously have your very own mind about climate models and everything climate science says, I find it better to use analogies from other fields. You don’t trust models, so you will have problems with all kind of predictions that are based on models. I can also write that you watch out for climate change when we reach 2°C by 2050! Should we wait until 2050 then before we do anything? Just to see if those models were right? And then? People like you will still say that predictions about the future are not to be trusted and will still oppose investing in a more sustainable economy. It’s a low single percentage of the economy. $38.4 trillion is over half the global economy. And for what? A paltry -0.17°C cooler temperatures by 2100 (assuming that the current models are correct). Why is that worth it? For comparison, if the US could somehow make their health care system as efficient as those of other industrialized nations, they could pay double or triple their share of this investment in the future. It’s not an “investment” for the U.S. It’s wasting U.S. taxpayer money on something that will have no net effect on global CO2 emissions. 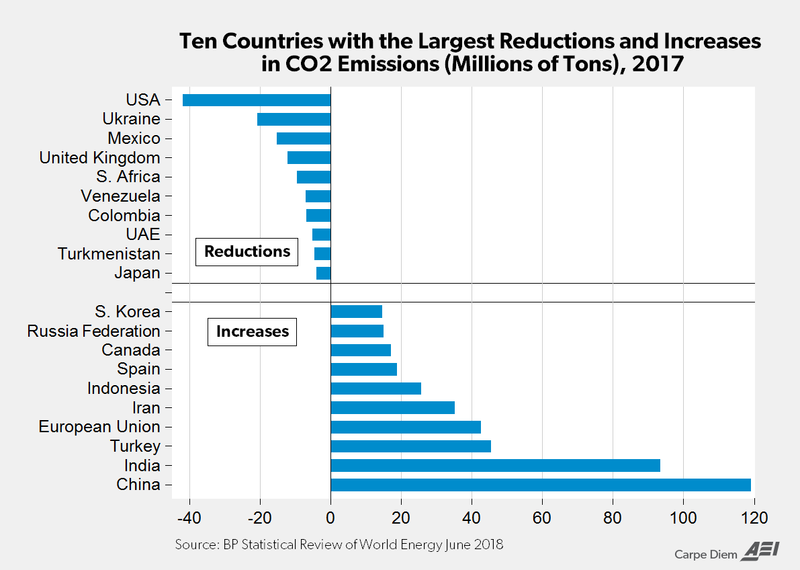 The U.S. is already leading the world in emissions reductions. Most other countries — including the EU — is heading in the other direction. Especially China and India. The U.S. national debt grew from $8 trillion in 2008 to $20 trillion by 2016. The budget deficit is something like $800 billion every year. Just paying the interest on the debt eats up more than can be paid for further “investment” in landscape- and habitat-destroying wind farms. Wind and solar are not a “sustainable economy”. They are intermittent and therefore unreliable energy sources that need fossil fuel backup (assuming nuclear is phased out too) to sustain them. Wind and solar infrastructure has grown exponentially in the last decade, and yet CO2 emissions have not been curtailed and in fact have grown right along with them. CO2 emissions will continue to rise as developing countries increasingly use fossil fuels to power their grids and Asian and Middle Eastern countries refuse to cut back on their fossil fuel investment. Kenneth, since you obviously have your very own mind about climate models and everything climate science says, I find it better to use analogies from other fields. Considering every time you use analogies about frogs and rockets and asteroids and car accidents and bank accounts and whatever else you can gratuitously concoct I tell you that I find your analogies worthless and irrelevant, why do you insist on continuing to employ them? I have to conclude that you do so just to annoy and distract. I couldn’t care any less than I do about your analogies. As soon as I see you start with “Let’s say…asteroids”, I stop reading. I don’t even bother. I will be deleting analogies from future posts. You’re going to have to actually address the points directly rather than pivoting to analogies. We’ll see how far you get. I also will do what I can to catch instances in which you have responded to a comment by attacking the source (i.e., an ad hominem) rather than responding to what is written. Yonason’s too valuable a commentator to lose because of this behavior. And please stop whining about how unfair it is that other people are saying mean things to you and calling you names, and therefore you should be allowed to do the same. Grow up. …spike55 commented on the folly of spending trillions to prevent what is most likely an imaginary loss, and at most a much smaller one. Apparently it doesn’t pay as well as harassment of skeptics. So this blogger is basically saying that anyone who says CO2 causes warming is anti-life. Great! No, he’s not “basically” saying that. He’s saying that CO2 shouldn’t be vilified as a pollutant when it’s critical to life on Earth. How is it that you could misinterpret these comments so profoundly and so consistently? Did your comment contain insults and cheap shots? (Probably.) See if you can refrain from stooping to that level (i.e., claiming that skeptics think “reptoids” or “unicorn farts” control the climate or or believe in “fantasy” and “vanishing” forcing and a “flat Earth”). Then see if you can refrain from commenting about how unfair it is that you can’t insult people while others are allowed to (But, but…this blogger doesn’t behave himself either!). In other words, stop whining and conduct yourself with civility and treat others respectfully. Why do you have to be reminded of this on a nearly daily basis? In other words, stop whining and conduct yourself with civility and treat others respectfully. Then stop presenting people that whine and aren’t civil if you don’t want this on your blog! When “nutty scientists” is ok in an article, I am assuming it is ok in a comment. Maybe you should have reminded spike55 hourly when he was still posting comments. Look how calm and relatively reasonable conversation are now without someone screaming in between all the time. The Keeling Curve is indeed the Oracle of Climate! See Thee not, the folly of your doubt-sowing, tobacco-lobby ways? Repent, invest in solar panels & wind power and be saved. And Algore is his profit. But CO2 isn’t a “pollutant,” not even if it might in the future be found to cause a bit of warming. While I would agree that one expects journalists and politicians to lie, especially if the lean Left, I certainly don’t think that justifies them doing so. I think Kenneth had tongue firmly pressed in cheek. Thanks Kurt. It was totally out of character, wasn’t it. You guys are probably using the literal meaning of the word pollutant, are you? CO2 is obviously not “poisoning” the air or something like that. Good! Then we agree it is not a pollutant! Since the author says it, it must be wrong? What do you find disturbing? I just asked you if you agree CO2 is not a pollutant. I think it’s important to show the OTHER (more accurate) graph of the pause/hiatus shown in Schneefan2015’s article, but not shown here. You know, the one without the piece from the previous pause that was lower, that warmists added in order to skew the graph to give the appearance that temps are rising. Funny how, even with their misleading, the data still don’t agree with the ridiculously incorrect models. And remember, for the umpteenth time, what is plotted are not temperatures but temperature anomalies. Why? Because if they plotted temperatures their scam would be totally transparent. Sure … https://imgur.com/a/FjXAnDN totally incorrect models. Yet another warmist activist socialist admitting that the climate isn’t the issue. Impoverishing the middle class to distribute shared misery around the world is the real goal. Can’t argue with that logic. If you say it is so, it has to be this way. In fact I remember my leader talking about this at the last leftist activist summit. NH snow cover trend has been flat since 1994. That shows the area of the Earth which is at or below 0 C hasn’t been changing, at least in the northern hemisphere. I can’t see how global temperature is rising if snow cover isn’t falling. Kenneth Richards asking the name-calling alarmists who frequent this site. around money available for alarmist trolls who haunt sites administered by skeptics. George Soros and the Russians (who don’t much like the idea of US fracked gas and oil undercutting their European markets) are known to reward the purveyors of the constant drivel posted by the likes of several who live here for free. All of the models rely on algebra based on the Stefan-Boltzmann (SB) equation. The University of Washington teaches that 239.7 W/m2 solar radiation can only a induce 255 K surface temperature on the Earth’s surfaces assuming blackbody conditions. They ten teach that 239.7 W/m2 atmospheric radiation combines with 239.7 W/m2 solar radiation to induce a temperature of 303 K on the Earth’s surfaces assuming blackbody conditions. If you understand blackbody radiation and the principles of calculus even a little you must acknowledge this proves the basic model of the “greenhouse effect” (the only model that exists) is totally wrong ! If it is totally wrong, which it is, then every model that adds up radiative fluxes using the SB equation is also totally wrong. I don’t know what the algebraic sum of 239.7 + 239.7 = 479.4 represents BUT IT DOES NOT REPRESENT THE PLANCK EMISSIONS FROM A 303 K OBJECT and this invalidates so much of the algebraic manipulations I regularly see espoused by PhD qualified climate “scientists” that I now do not believe virtually anything they say. My maths is right and theirs isn’t – it is that simple ! Dr. Anderson, PhD is also very critical of the NASA model. VERY CRITICAL! You are barking at the wrong tree here. Nice one! That was the exact tree that was barked at. Since you posted that diagram, can you see where the addition of fluxes is happening and do you understand that this is wrong? Oh and the diagram I posted makes perfect sense. 161 W/m² of solar radiation reaches the surface, 17+80 W/m² are “emitted” by thermals and evapo-transpiration and surface radiation amounts to 396 W/m² because the downwelling LW radiation equals 333 W/m². So 161 + 333 = 17 + 80 + 396 … well, it’s not exactly equal because of the imbalance included in that diagram, but I think you get the point. you do not understand what has been said. You adding up radiative Fluxes, which you have been told is wrong. You have to use the Planck curves and not Mathematics. This is a Physics problem, which you clearly have not understood! The diagram you referenced might seem mathematically correct for you, but it is physical garbage. Fluxes do not add up and 396 W/m2 as an addition of incoming Fluxes, has no expression of a temperature. Your link the first question is asking How much Energy Earth receives. That is a nice question and you will get a mathematical correct answer. Yet in a physical context the answer is wrong. Earth receives Energy from the sun on only one hemisphere at a time. There is nothing in you diagram that reflects this physical fact. As a matter of fact it represents a wrong physics, since it pretends that Earth receives the energy all around the globe at any given time. This is wrong. As a matter of fact it represents a wrong physics, since it pretends that Earth receives the energy all around the globe at any given time. This is wrong. So you think it is not allowed to average over a longer time period? That might be true for the Moon where the surface get heated to the max possible temperature and also has enough time to cool until the next day cycle begins. But for Earth? Seriously? And yes, I know that two places with a temperature of 100 and 200 K, average 150 K, but the average heat radiation is not that of a 150 K surface. you do not understand what has been said. You adding up radiative Fluxes, which you have been told is wrong. You have to use the Planck curves and not Mathematics. Nope, adding those fluxes is perfectly valid. You just can’t calculate a temperature from them the simple way. But then again, that is not what is happening in those diagrams. The upwards flux is derived from a temperature. The temperature is not derived from the summed up downward fluxes. try to educate yourself before you run your own physics universe. Read up on Planck. Please! Two places with 100k and 200K are just two places with this temperature. Even the attempt to calculate an average temperature is wrong. Or for that reason an average radiation. Thats what you posted, thats what is in the diagram and that is what is wrong! Adding two Plank curves results in another one. The area below the new curve will be exactly the sum of the area of the two curves you used. And that’s just basic math. Two places with 100k and 200K are just two places with this temperature. Even the attempt to calculate an average temperature is wrong. Nope. But I hope you are aware that an average temperature is something that doesn’t exist in reality. Saying calculating an average is wrong, … well … is wrong. how does it work? Read it! For you in short: There is no extra energy. All energy that you deal with is dynamically going through the system. So there is no additional W/m2 unless there is a higher temperature, A higher temperature comes from MORE energy. Can you demonstrate that there is MORE energy? Where is it coming from? Or are you saying that CO2 is an energy source like your additional laser. Try the example the other way, you have 4kW of power available and now you have to power two laser, what happens? No, I like you, the engineer, to demonstrate how adding fluxes isn’t a simple math operation. 100 W/m² + 100 W/m² equals 200 W/m². Even the OP says so in his linked document … so why are you seemingly claiming that this is not the case? For you in short: There is no extra energy. Of course there is. Heat content accumulates causing more upwelling LW radiation … until an equilibrium state is reached where what is emitted to space equals what we receive from the Sun. Imbalance of the radiative fluxes. But this is kind of a distraction now. You are saying one can’t add up and substract fluxes. Why? For the sake of these calculations, yes. An energy source that is fed mostly by what the surface emits. Thus the net flux is still from the surface towards the atmosphere and ultimately space. Nope, a better fitting example would be a laser pointed at some object that emits into space. When the object reaches equilibrium temperature the netflux will be 0 W/m² despite 4 kW still pointing at this object. Why? Because we can do simple math with outgoing and incoming radiation fluxes. Add a layer that is transparent to the laser around the object, but not to what is emitted by the object and now you’ll have this layer emitting the 4 kW into space. But it is also emitting 4 kW towards the object it surrounds and thus the object will again increase its heat content and thus temperature and emit 8 kW towards the new layer which results in a net flux of the previous 4 kW. No additional energy input from the laser, yet the surface of the object is now hotter than before. You as an engineer should know how this principle works. It’s called insulation and the atmosphere happens to be our insulation layer towards space. “For you in short: There is no extra energy. All energy that you deal with is dynamically going through the system. So there is no additional W/m2 unless there is a higher temperature, A higher temperature comes from MORE energy”. I guess his answer would be that,due to the supposed insulating effect of CO2,a certain amount of additional energy would be given to the system. Not necessarly think this is right,just guessing the reply. Almost no heat transfer from the Atmosphere to the surface either. No second laser, no second sun! Emission from the atmosphere is not a heat flux. SebH do you agree that there is no heat flux from the atmosphere? Please look up heat before your answer. John, you are again trying to construct something that is pretty obvious but you think I am somehow arguing against. Why? No, the atmosphere is not heating the surface like another source of energy/heat would. It is purely an insulating effect. Heat content builds up due to this and thus the temperature increases. But this thread was about adding fluxes before you pivoted to CO2 forcing not being a source of energy (which is kind of obvious). You seem to argue that you can’t add up a 100 W/m² downward flux and another 100 W/m² downward flux because this would not result in a 200 W/m² flux. Likewise, you seem to argue that a 100 W/m² flux in the other direction would not reduce the a 200 W/m² downward flux to a net downward flux of 100 W/m². Is that correct? The different gradients of surface heating would appear to be more a function of the lapse rate (i.e., gravitational pressure), not the “insulating” effect of water vapor (the dominant “heat-trapping” gas deemed responsible for about 75% of the greenhouse effect). The atmosphere is thicker near the surface, and the thickness/thinness of the atmosphere is the determinant of its “insulating” properties. The same principle applies for Venus, which has an atmosphere that is 92 times thicker than Earth’s. The thickness or thinness of a planet’s atmosphere is its insulating “greenhouse effect”, and the pressure appears to set the surface temperature for the planet. The only areas of temperature variance on the surface of Venus, for example, are the regions where the gravitational pressure is weaker. The weaker pressure areas lead to (significantly) cooler temperatures at these locations. Jupiter’s atmosphere is 318 times thicker than Earth’s, and despite that planet being much further away from the Sun and having essentially no “greenhouse gases” in its atmosphere (hydrogen and helium only), its surface temperature reaches 725°C. Pressure doesn’t set the temperature, it can’t in an open system. Neither does the gradient somehow start in the atmosphere and sets the surface temperatures, it’s the other way around. Yes, thickness somewhat determines the insulation effect, but you won’t get any radiative insulation from a pure nitrogen atmosphere either. And no, it’s the GHE on Venus as well. And Jupiter is still contracting from its formation … that’s what causing heat there. None of the atmospheres of the rocky planets are being further compressed. Anyway, back to fluxes, enough with the distraction strategy. John, why can I not add up two fluxes? 100 W/m² + 100 W/m² equals 200 W/m² … what else should those two fluxes add up to? Oh, I read the second part of your document. You are one of those heat doesn’t flow from cold to warm kind of person. Congratulations on making that observation, but the greenhouse effect is not about heat flowing from cold to warm. That never happens. Rosco, in the sense of how the article itself calls people … you are a bit nutty. 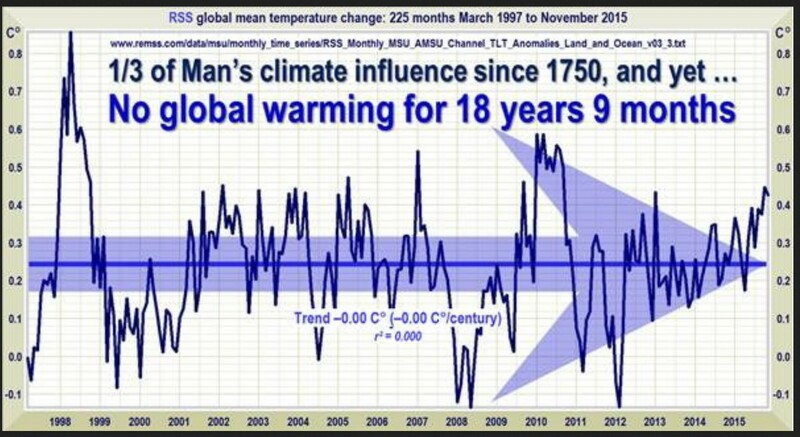 As usual, the IPCC are deliberately trying to mislead us. It’s all they know how to do. Typical Ad Hom response from the bottom feeding troll. Pierre, I’ll be back after you’ve dealt more effectively with the riffraff. I mean, how much disruption of your otherwise excellent blog can you tolerate? He comes into your space and spits on all your other guests, and you do nothing. I’m going to join spike till there’s a change. We should set up betting pools on various scenarios and put our money where mouths are.the loser has to donate his/ her money to Friends of Science for fostering this debate. dioxide is not a pollutant. It is a life giving, basically inert gas. concur that cold has caused the demise of more people than heat has? The same reason why two hot iron bars do not make anything yet hotter again. Or why one does not add temperature values in physics. Or because the atmosphere does not provide a heat flux in the first place. John, you are confusing temperatures with radiative fluxes. So you think it would not be warmer on Earth if we had two Suns? Really? Please demonstrate how an object doesn’t get warmer when subjected to the radiation from two instead of one hot iron bars! We are not talking about adding temperatures! We are talking about fluxes. You said you can’t add/subtract fluxes … so, explain why? So you conveniently do not address the the fact that there is no Heat flux from the atmosphere to Earth. Since you always refer back to “two suns”, “two lasers” I have to assume that you think the atmosphere is indeed a heat source. But you are wrong. Why am I not surprised that you do not understand the argument about temperature or the iron bars. You have never heard of black body radiation, Stefan Boltzmann or anything. You surely have never made the connection to quantum physics. If you did, then why are you not capable to draw the conclusion that if all normal matter emits electromagnetic radiation and whether this being hot iron bars or bricks it does not matter, that two of each at the same temperature will emit electromagnetic radiation and yet none of these fluxes would add up to increase the temperature of either body. The sun is a heat source for Earth. The atmosphere is not a heat source for Earth. The question what two suns are doing is irrelevant, we only have one. You are creating smoke screens or you are incapable of the necessary physical comprehension. All that I can see is left in you is a very big ego that has forgotten to take its educational medicine. And if you need to know a third object that is not as warm as the hot iron bars will get warmer, I said nothing will get hotter. If you do not understand it here is what it means – the third item cannot have a higher temperature than the iron bars. The above is my last post on this. Your misquoting and intentional false interpretations of my post makes a further discussion useless. I never said you can’t subtract fluxes. But I acknowledge that you actually know that this is how the heat flow is calculated for radiative heat transfer. Great, both replies to what John wrote deleted … so his nonsense stays up unrefuted? He comes up with obvious stuff and argues I would be against it. How is that ok? It’s straw men all over. He still hasn’t answered why one can’t add two fluxes and distracts by pivoting to temperature. How is that ok? Which is just unbelievable regarding he is the one who misinterprets everything I write and comes up with this ridiculous replies about me having a big ego … seriously, wth!?! He can’t admit when he was wrong … take that for big ego. We’re all waiting for your identity, academic CV, credentials, qualifications which allow you to act like the ultimate expert who demands having the last say on every issue here. I’m giving you 20 hours. If we don’t get this, then don’t expect very many of your “expert” comments to appear here. You adding up radiative Fluxes, which you have been told is wrong. You have to use the Planck curves and not Mathematics. This is a Physics problem, which you clearly have not understood! So … how does adding up the area below Planck curves change the outcome of just adding up the fluxes? 100 W/m² + 100 W/m² is still 200 W/m² … and 200 W/m² in one direction with opposing 100 W/m² results in a net flux of 100 W/m², Planck curves or not. I am almost glad your posts were deleted. You were dishonestly suggesting I said fluxes can not be subtracted. I never said anything about subtracting fluxes. One cannot add temperatures and this is the explanation why you cannot add radiation fluxes. Particularly not if you want to calculate a temperature out of that addition afterwards. You call this nonsense and I call this real physics. After all this mess, I’ve got an honest questione about what, I think, is the actual core of the entire subject.Firstly I’d like to clearly say that, from my poor knowledge offerte chemistry and physics,seems weird sustaining that CO2 and its amount variation could be the critical knob of something as complex as climate. I think I’ve understood what GHE theory is about. Now,my question is:what measurment are supporting this theory?How and when has been detected and quantified the supposed imbalance of radiative budget caused from GHE?Guess that the answer to these questions would help to better face the entire discussion. Thanks in advance for the attention. I think you deserve a reply. To me knowledge there have been attempts to measure the GHE but I have not seen a compelling paper that presents actual measurements. If the GHE works all over Earth it should be present in any location and measurable. There was a paper 3-4 years ago that claimed that they measured the GHE for somewhere in Canada or Alaska. I thought I saved a link, but it it also possible that my bias made me disregarding this as stupid. Shame on me! The idea of the GHE is not new and was debunked and confirmed right from the beginning. Also the role CO2 is meant to play has been defined very early in the game, as soon as the absorbing quality was discovered and a climate connection made. There is a lot of conflicting arguments out there that go for and against the GHE. But some diagrams that are supposed to explain the GHE are physical junk. Partially this is what the discussion is about above.